I’m am beyond ready for spring. The sun is shining, it’s warm-ish, the cherry blossoms are budding and we are starting to see some early cherry tree bloomers around our neighborhood. Add a trip to LA last week to the list and well, if I had control over the weather, there’d be no chance of below freezing temperatures. But, alas, I don’t have control over the weather! What I do have control over is eating spring produce. If you were to open my fridge right now you’d find it stuffed with asparagus, kale, blueberries, cabbage, leeks and other seasonal spring produce. My desire to eat fresh foods is also equal to my desire to not spend too much time in the kitchen laboring over a more complicated recipe. But ya know, don’t hold me to this if the next recipe I bring you is more complex, my kitchen whims come and go. 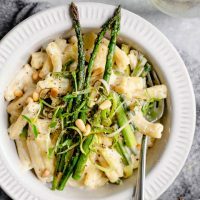 Creamy pasta is always a go in my book, and that is evidenced by the countless creamy pasta recipes I have on my site. If you have a high speed blender and nuts in the fridge they require almost no forethought. Blend up the sauce, cook the pasta, and voilà dinner is served! But even without a fancy blender it’s easy. Soaking the nuts in water for a couple of hours softens them and makes them easier to blend. If you are in a hurry, you can soak them in boiling hot water for 30 minutes. Or you can plan ahead in the morning and cover the nuts with water, stick them in the fridge, and use them come dinner time. To use them, simply drain the water, give the nuts a rinse, and they’re good to go! I’ve added a couple more steps to this recipe, mainly to add vegetables to the mix. 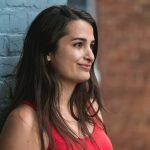 But it’s an easy meal that’s super delicious and oh so satisfying! 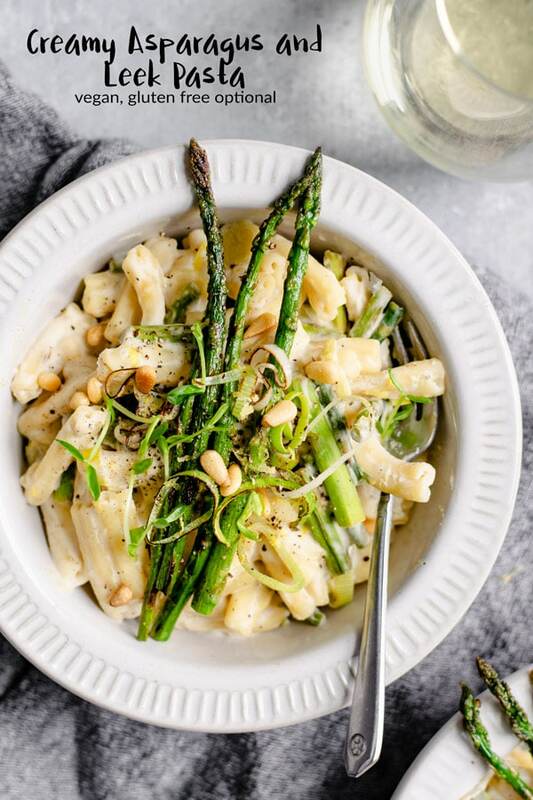 How to make this easy creamy pasta recipe? First, prep your veggies. Zest your lemon, saving the zest to add to the final dish, then juice your lemon. Chop off the woody ends of the asparagus and dice them into bite sized pieces. Save a couple whole (with just the ends trimmed) for garnish if you’d like. Chop off the coarse green part of the leeks and the stem. Then wash the leeks reallllly thoroughly, the sandy dirt they grow in likes to work its way into the layers. Then thinly slice the leeks, keeping an eye out for dirt and washing more if needed. Next, bring a pot of water to boil for the pasta, and cook it to package directions once boiling. Also, blend up your sauce. Into the blender toss the almonds (soaked in water if not using a high power blender), water, nutritional yeast or vegan parmesan, a peeled clove of garlic (coarsely chopped if your blender needs the help), a drizzle of olive oil, white or light brown miso, lemon juice, and tapioca starch. Blend until the sauce is smooth, or as smooth as your blender goes! Now we cook the asparagus, heat up a big skillet and add a splash of olive oil. Add the diced asparagus and a few pinches of salt and black pepper. Sauté until just tender, about 5 minutes, then add a splash of wine (or broth, or nothing, it’ll be good either way), let it infuse and evaporate and remove the asparagus from the skillet. Repeat with the whole asparagus for garnish if you want to serve it like I did in my photos! Add a little more oil to the skillet and then the leeks with another few pinches of salt and black pepper. Cook until the leeks are softened and taking on a bit of color, then pour in the sauce. Bring the sauce to a simmer and let it cook and activate the starch so it thickens. 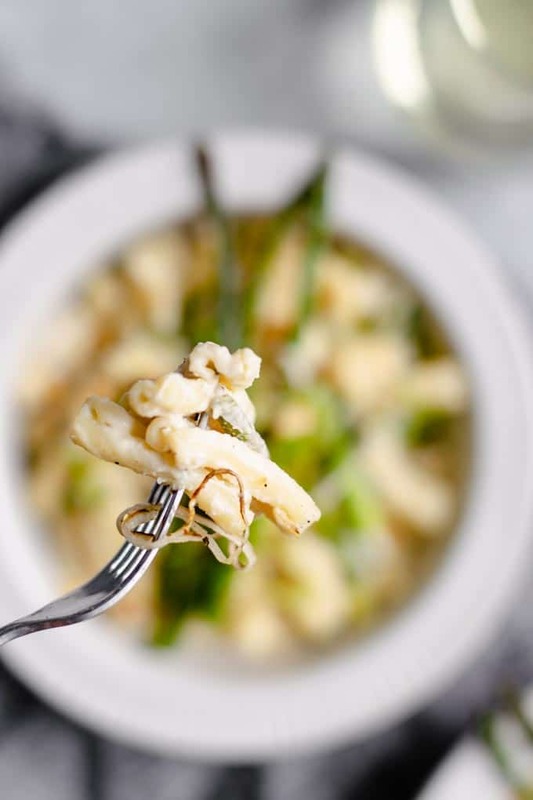 Once thick, toss in the cooked pasta and the asparagus and reserved lemon zest. Taste and add more salt and pepper to your liking and serve hot! I like to add some toasted pine nuts to mine for an added special touch. 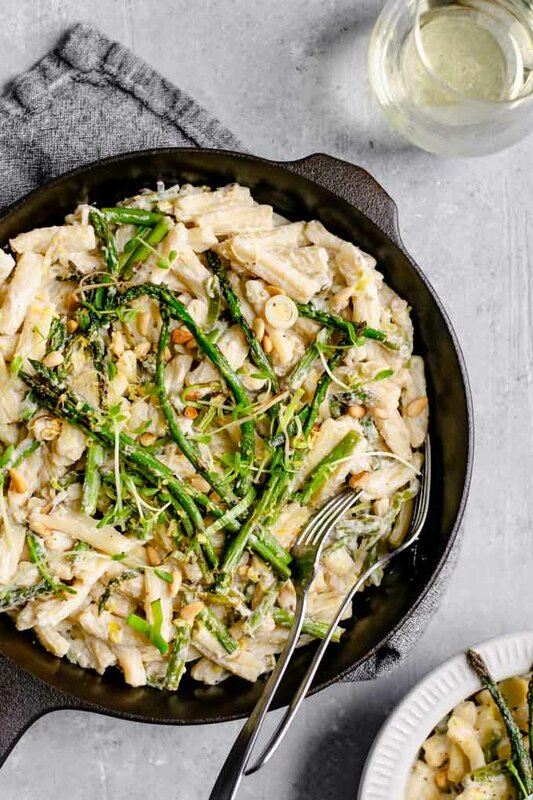 In no time you have a creamy, hearty, and satisfying meal that’s full of veggies. I love the freshness the lemon juice and zest brings to the pasta, and the mild oniony flavor of the leeks. 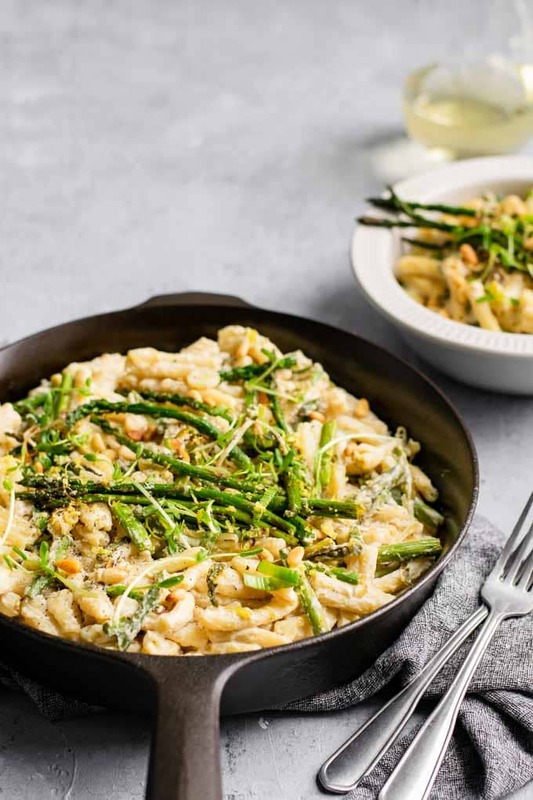 It’s definitely a recipe you’ll want to make while asparagus and leeks are in season! for the almonds, I use blanched and slivered almonds. This means the skin is already removed so the cream sauce you make is more of a “pure white.” I suppose there is nothing wrong with using whole almonds. There’s a lot of nutrition in their brown papery skin, it’ll just leave some texture and flecks of color in your sauce. And you can always soak the nuts yourself and pop off the skin before blending. This recipe is gluten free except for the pasta, but these days it’s so easy to use a gluten free pasta if that’s what you need or want! The only other thing you want to keep an eye on is your miso, most is gluten free but it’s always a good idea to double check! When choosing asparagus, it doesn’t matter too much if it’s thick or thin, but the stalk should feel firm and fresh. The cut bottom should not look too dried out or woody and the tops should be closed and compact. Use the asparagus soon after purchase so they don’t dry out, or re-trim the ends and store them in shallow water or with a damp paper towel around the base. You want your leeks to have a longer white and light green part, and also be crisp and firm. If you can only find thicker leeks with a smaller light colored section, then use 3 instead of 2. Miso is a Japanese fermented soybean paste (sometimes made from chickpeas or other ingredients). It’s salty and full of rich umami flavor. It adds a lot of depth to sauces, dressings, and dips, as well as some of that cheesy funk. It’s also good for you, and lasts seemingly forever in the fridge, so it’s a great ingredient to have on hand! 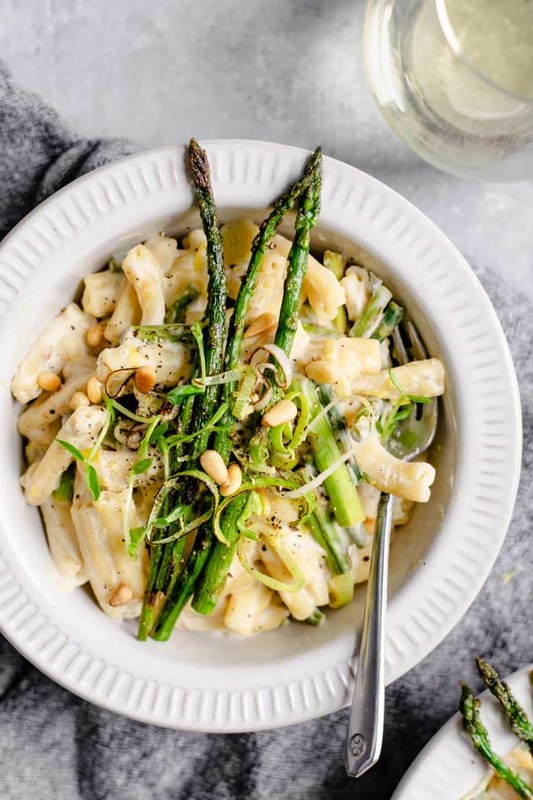 If you make this vegan creamy asparagus and leek pasta, leave a comment below and rate the recipe on the recipe card. And please share your photos with me on Instagram, tag @thecuriouschickpea and #thecuriouschickpea. I love seeing your recreations! 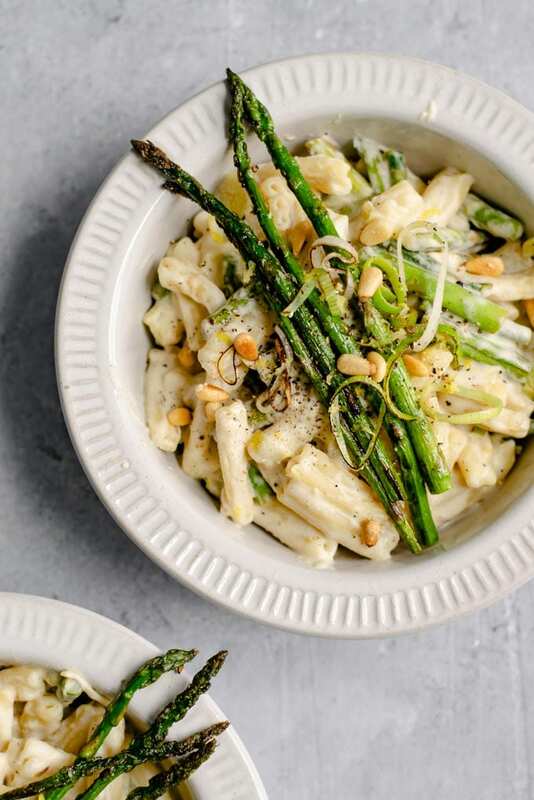 This easy creamy asparagus and leek pasta is a perfect meal for spring! 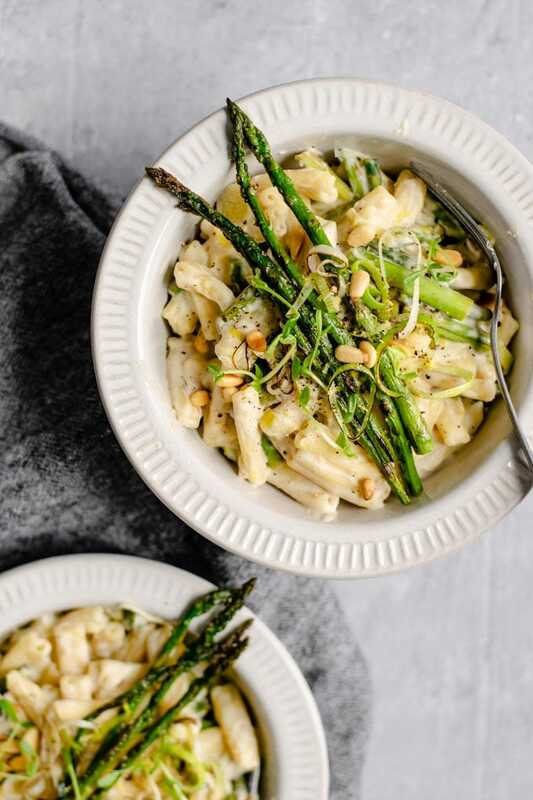 Made with a vegan almond cream sauce and sautéed asparagus and leeks, this flavorful and satisfying meal is healthy and wholesome without sacrificing flavor. In a blender add the almonds, water, nutritional yeast, tapioca starch, garlic, and miso. Blend until smooth and creamy, then add the olive oil and lemon juice and blend to combine. Heat a large skillet or pot over medium heat. Add one teaspoon of oil and the asparagus with a few pinches of salt and pepper. Cook for about 5 minutes, or until the asparagus is tender. Add the white wine to deglaze and then remove the asparagus from the pan. Add the second teaspoon of oil to the hot pan along with the leeks and a few pinches of salt and pepper. Cook until the leeks are slightly charred and soft, about 3-4 minutes. Pour the sauce from the blender over the leeks and bring to a simmer. Turn the heat down and let cook for a few minutes until the sauce thickens. Add the cooked pasta, asparagus, and lemon zest. Stir to combine then turn off heat. Taste and add salt and pepper as desired. Serve garnished with toasted pine nuts and some fresh herbs or microgreens. Toast pine nuts at 325 ºF for about 5 minutes or until they are a couple of shades darker. Or roast over a dry skillet on low.